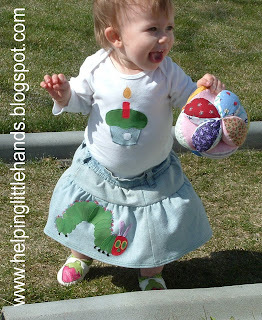 I hope you all joined me for the the skirt tutorial and the tutorial for the Very Hungry Caterpillar Applique. If not, just scroll down. 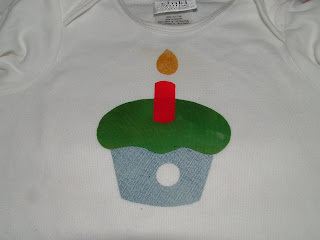 You could very easily leave the hole in the cupcake out and it would work for any First Birthday for a boy or a girl. 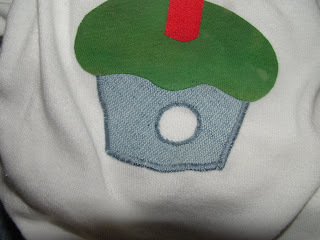 I came up with the design for the drawing of the cupcake on my own. I decided to use fabrics that would match the skirt, so I used some of the green scraps from the Caterpillar for the cupcake top and a scrap of the denim for the cupcake bottom. I used the same fabric as the eyes and head for the candle and flame. 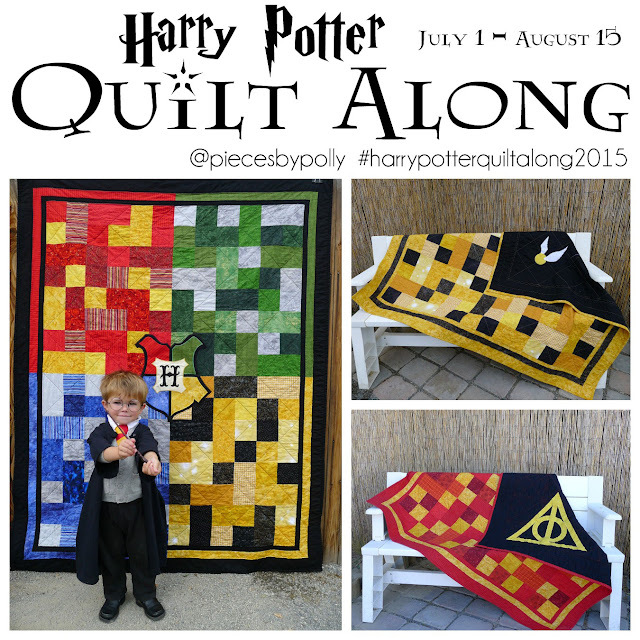 The basic techniques for the applique are the same as the other tutorials I've done. 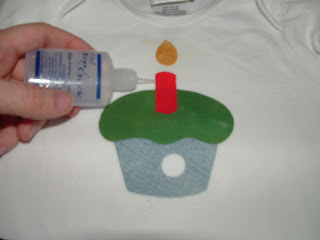 Trace your design on the papery side of the Heat 'n Bond Lite, then iron it onto the BACK side of your fabric. 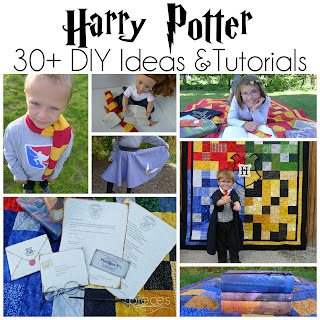 Cut your design out of your fabric. Peel off the paper, and apply to your onesie or shirt. I put Fray Check around the edges of any woven fabrics and put some extra around the inside of the whole. I used a satin stitch (zigzag with the stitch length set almost to 0--for more information see this tutorial) around the outside of the denim because denim is especially prone to fraying. I just did a straight stitch around the caterpillar hole because I thought that would be cute if it frayed just a bit. I STILL USED FRAY CHECK though. **Note: This tutorial is not as complete as some of the others I've done, so if you have ANY questions, feel free to leave a comment or sent me an email. If you like that little munchkin's skirt and want to make one for your own little one, be sure to check out the tutorial.